It’s much easier to stay on track when you find a workout routine that works for your specific body. Plus, a consistent routine will make you finally feel like you’re making progress. But when you suffer some sort of pain or injury, that progress can be quickly knocked off track. This is the case for many people that suffer from hip pain due to an injury. 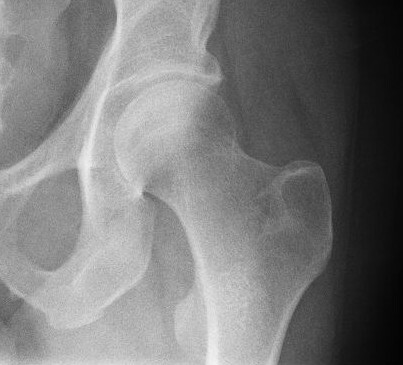 The risk for hip injury increases with age. According to the Agency for Healthcare Research and Quality, over 300,000 adults over the age of 65 suffer from hip fractures each year. It doesn’t help that many popular exercises are strenuous on the hips, including hiking, walking on uneven ground, heavy weight lifting routines, running, and a variety of sports like basketball and soccer. But there is no need to lose your motivation and progress just because of a set-back caused by hip pain. There are many low-impact exercise options to strengthen your hips. These may help prevent an injury before it happens, and will also help keep you moving and shaking throughout your recovery. “It’s a good idea to focus on quad, hamstring, and gluteal strength,” says Kelton Vasileff, M.D., an orthopedic surgeon at The Ohio State University Wexner Medical Center. These muscle groups surround the hip joint and work to protect it. Working your core muscles will also help increase balance, posture and stability during movement. “Strengthening your core helps to normalize your walking pattern and stabilize how your pelvis and hips move,” he says. These elements facilitate an increase in range of motion while minimizing pain. You can do the following easy to-do exercises anytime, anywhere so that nothing gets in your way. 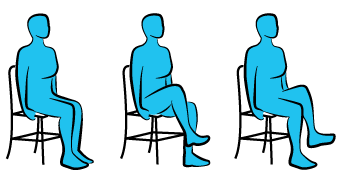 Seated Knee Raise – Using a chair, sit on the edge with your knees bent at a 90 degree angle and your feet flat on the floor. You can hold on to the edges of the seat to help with your balance. Keeping your knee bent the whole time, lift one leg about six inches off the ground. Hold for three counts, lower back to the ground with control and repeat on the other side for one rep. Do 10 reps total. Seated Leg Extension – Using a chair, sit on the edge with your knees bent at a 90 degree angle and your feet flat on the floor. Hold onto the edges of the seat for balance. Without moving your left foot and keeping your upper body stabilized, straighten your right knee so that your leg is parallel to the floor. 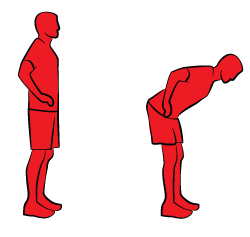 Hold for two counts and lower back down with control until it rests in the beginning position. Repeat 10 times on your right leg and then do the same on the left. Hip Hinge – Stand upright with your feet hip-width apart and hand on your hips. Tighten your core and bend your knees slightly. Making sure to keep your knees slightly bent and your back straight, bend forward at the hips to lower your torso. Lower until your torso is parallel with the floor (or as far as you can go while keeping your back flat). Pause and then raise your torso back up until you are back in the starting position. Make sure you squeeze your glutes and push your hips forward as you lift to avoid strain on your lower back. Repeat for 10 reps.
“When it comes to your workouts, low-impact aerobic exercises are generally best and least likely to cause issues,” Dr. Vasileff says. “I recommend swimming, walking, elliptical, cycling and stationary biking for general exercise,” he says. Swimming– A great low-impact workout, swimming allows you to work all of the muscles in your body without any harsh impact on the hips. 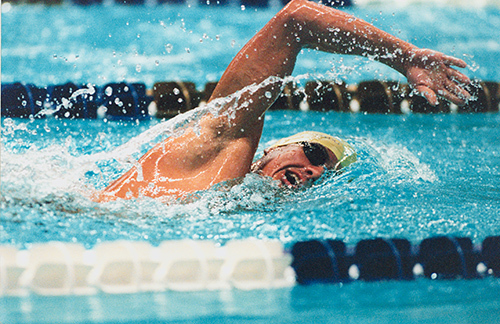 Swimming laps lets you to control your pace throughout your workout and find what works best for you. You can also create a lot of variation by trying different strokes – butterfly, breaststroke, backstroke and freestyle – to challenge your muscles and keep your workout from feeling stagnant. 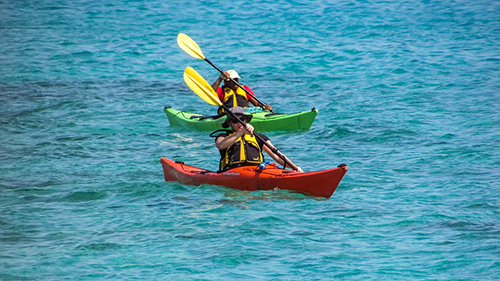 Rowing – Rowing machines (or rowing in a boat) offer a full-body workout and excellent cardiovascular training with essentially no impact on the joints. Maintaining proper form allows you to work your hamstrings, quadriceps, glutes, back and arm muscles all in one fluid motion. 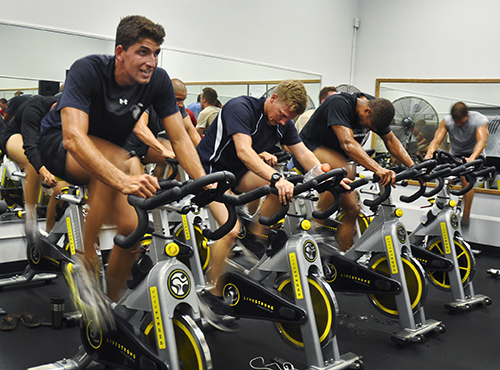 Stationary Cycling – Stationary cycling gives you a good cardiovascular workout while strengthening your quadriceps in a comfortable, controlled environment. A stationary bike will let you control your resistance level and pace while removing variables such as potentially rough terrain, inclement weather and wind. 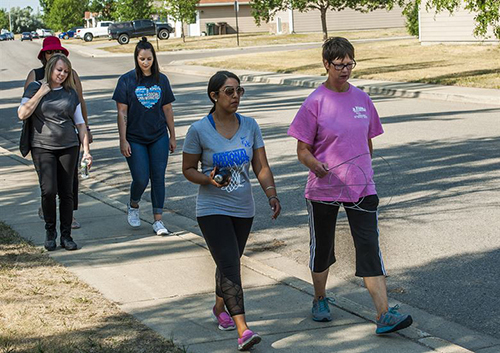 Walking – Walking can get your heart rate going while working your muscles and joints in a natural non-strenuous way. For those suffering from hip pain it is necessary to make sure that you are walking somewhere that doesn’t have any uneven surfaces or terrain, as these can pose unforeseen dangers. Treadmill – Since walking on an uneven surface is difficult for those with hip pain and poses the threat of potential injury, a treadmill is a great way to get the strengthening and cardiovascular benefits of walking, without any of the risk. 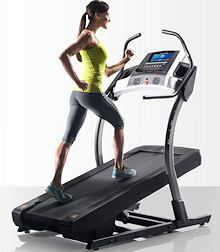 Most treadmills allow you to adjust the speed and the incline of your workout. In fact, the NordicTrack Incline Trainer lets you take this to the extreme with a 40% grade! You can really challenge yourself and your muscles while varying your workout to keep from getting bored! The NordicTrack Incline Trainer lets you get a great workout simply walking at a steep grade. This is a hip friendly way to break a sweat and burn some calories! Ellipticals – An elliptical mimics the motion of running with little or no impact, making it perfect for those with hip pain. A heavier flywheel with have a more smooth and natural motion, creating ease for your body. Adjustable pedals also help control hip extension to minimize any existing pain. Front drive ellipticals are often easier to mount but may create the feeling of “leaning forward”. You can also try a rear drive elliptical, which may be a little more difficult to mount for those with mobility issues, but creates a more natural gait. Test both types to find the one that works best for you and get moving. Another option is the ProForm Hybrid Trainer. It will allow you to work out either in the standing or seated position. 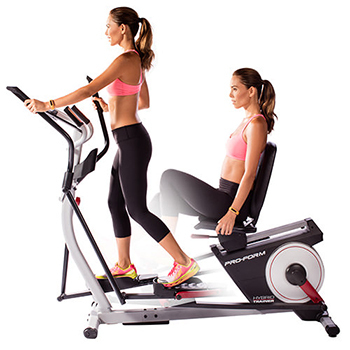 A seated position mimics a reclining stationary bike, so this is like two workout machines in one! Plus, they can be purchased at a relatively inexpensive price compared to many other machines. All of these options allow you to strengthen your hips, avoid injury and regain your mobility while recovering from prior damage. Check out our list of Best Buy Ellipticals here to find the right machine for your body and budget.